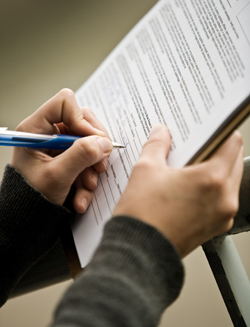 When you arrive at Core Solutions you will be greeted by our friendly staff and given some brief forms to fill out. Upon completion of intake forms you will be taken into the exam room for a consultation and exam with the doctor. Often times x-rays of the spine are needed. Those are taken as part of your exam on our state of the art digital x-ray machine. The doctor may recomend some therapies to alleviate symptoms between your first and second visits. The first visit typically takes 30 to 45 minutes depending on your health issues and questions. On your second visit you will have a report of findings. During this time the doctor will thoroughly go over your xrays and exam results with you as well as make recommendations for your course of care. We want you to have a good understanding of what is going on in your body, how long the problem has been there, and your options for getting it corrected. Again, this appointment time varies on the amount of questions you may have. This appointment could be as short as 20 minutes for some and as long as 45 for others. Give Core Solutions Chiropractic Center a call so we can help you take the first steps towards health.